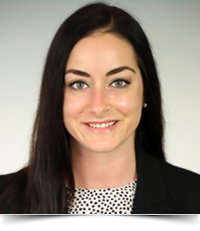 Ashley Peacock is an Associate in Reger Rizzo & Darnall’s Commercial Finance, Corporate & Business Services and Real Estate groups in the Firm’s Philadelphia, PA Office. Ms. Peacock focuses her practice on representing corporate and individual clients in a wide range of matters, including real estate, entity formation, shareholder, partnership and operating agreements, and drafting and negotiating commercial contracts and corporate governance documents. She also assists members of the Firm’s Estates & Trusts Group with trust and estates administration matters. While attending law school, Ms. Peacock served as a law clerk in Reger Rizzo & Darnall’s Corporate & Business Services and Real Estate departments, and also previously worked for a subrogation law firm in San Diego, California. Prior to attending law school, she served as a corporate and real estate paralegal at several Philadelphia-based firms, including Reger Rizzo & Darnall, where she assisted attorneys with the handling of civil litigation, real estate and transactional matters. Ms. Peacock is a 2018 graduate of Temple University’s Beasley School of Law, where she was a member of Temple’s Women’s Law Caucus and the Phi Alpha Delta Law Fraternity International, and a 2008 graduate of Pennsylvania State University. While attending law school, Ms. Peacock also worked as a volunteer mediator in the Philadelphia Municipal Court mediating landlord-tenant disputes.